In a statement, they said: "We are aware that Netflix are planning to screen a documentary in March 2019 about Madeleine's disappearance. "The production company told us that they were making the documentary and asked us to participate. "We did not see - and still do not see - how this programme will help the search for Madeleine and, particularly given there is an active police investigation, it could potentially hinder it." 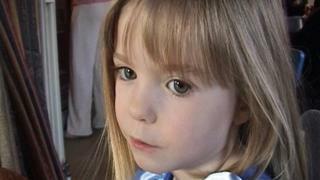 Mr and Mrs McCann also said their views were not reflected in the programme. Scotland Yard launched its own investigation, Operation Grange, into Madeleine's disappearance in 2013, after a Portuguese inquiry failed to make any headway. In November, a further £150,000 was granted to the investigation to allow it to continue until 31 March. October 2013: Detectives in Portugal reopen the investigation, citing "new lines of inquiry"
April 2017: The only four official suspects investigated by police are ruled out of the investigation but senior officers say they are pursuing a "significant line of inquiry"